And this is where the process stops. "Optimize connection buffer size" is disabled in Advanced Site Settings > Connection.
. 2015-08-19 05:59:08.031 Command-line: ".\winscp\WinSCP.exe"
. 2015-08-19 05:59:08.078 Looking up host "10.0.0.3"
. 2015-08-19 05:59:09.250 Reading private key file ".\winscp\keys\freebsd.prv.ppk"
! 2015-08-19 05:59:09.250 Using username "johnsmith".
! 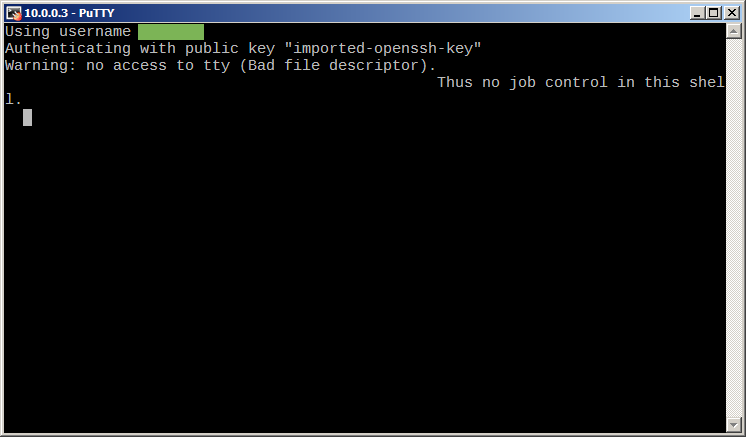 2015-08-19 05:59:09.312 Authenticating with public key "imported-openssh-key"
. 2015-08-19 05:59:09.500 Using SCP protocol.
. 2015-08-19 05:59:09.500 Doing startup conversation with host.
. 2015-08-19 05:59:09.546 Skipping host startup message (if any). > 2015-08-19 05:59:09.546 echo "WinSCP: this is end-of-file:0"
< 2015-08-19 05:59:09.546 Warning: no access to tty (Bad file descriptor). < 2015-08-19 05:59:09.546 Thus no job control in this shell. < 2015-08-19 05:59:09.546 whole year, type "cal -y".
. 2015-08-19 05:59:09.562 Detecting variable containing return code of last command.
. 2015-08-19 05:59:09.562 Trying "$status". > 2015-08-19 05:59:09.562 echo "$status" ; echo "WinSCP: this is end-of-file:0"
. 2015-08-19 05:59:09.562 Return code variable "$status" selected. > 2015-08-19 05:59:09.562 echo $LANG ; echo "WinSCP: this is end-of-file:$status"
! 2015-08-19 05:59:09.562 LANG: Undefined variable.
. 2015-08-19 05:59:24.578 Waiting for data timed out, asking user what to do.
. 2015-08-19 05:59:24.578 **Host is not communicating for 15 seconds.
. 2015-08-19 05:59:26.468 Closing connection. Oh my, I forgot to login! That was me. Something? Anything I can try? Can you try to connect with PuTTY with Connection > SSH > TTY > Don't allocate a pseudo-terminal turned on? Then try to type echo $LANG and let me know what the output is. In putty, I can't login if I turn on 'Don't allocate a pseudo-terminal'. However, somehow the problem got solved! I created a new session and although I've already done that a couple of times, this time I managed to login with WinSCP. What do you think was causing this? So I'm back with the problem. Warning: no access to tty (Bad file descriptor). Thus no job control in this shell. The output that I told you it gave me was when I logged in normally, with 'Don't allocate a pseudo-terminal' disabled. For now it seems to work. Is this what you though caused the problem? But as it seems like a default behavior in FreeBSD, I want to make WinSCP be able to handle it. The output is from PuttyPortable 0.63-t022. It seems that with printenv, you get the 'blah' but not with echo. Strangely, with sh as the default shell, I don't need to have $LANG defined to login! Please send me a log file with the default settings (Auto).